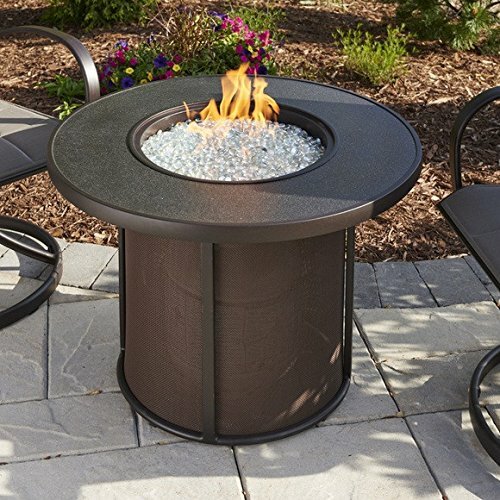 Fire pits are quickly becoming popular in the outdoor living area and this is so because fire pits come with a number of benefits such as providing warmth, accenting the outdoor area, completing other outdoor features such as swimming pools and pergolas well as some being important equipment for outdoor cooking. 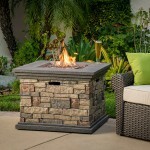 It is because of their popularity that fire pits have evolved in order to be more functional. 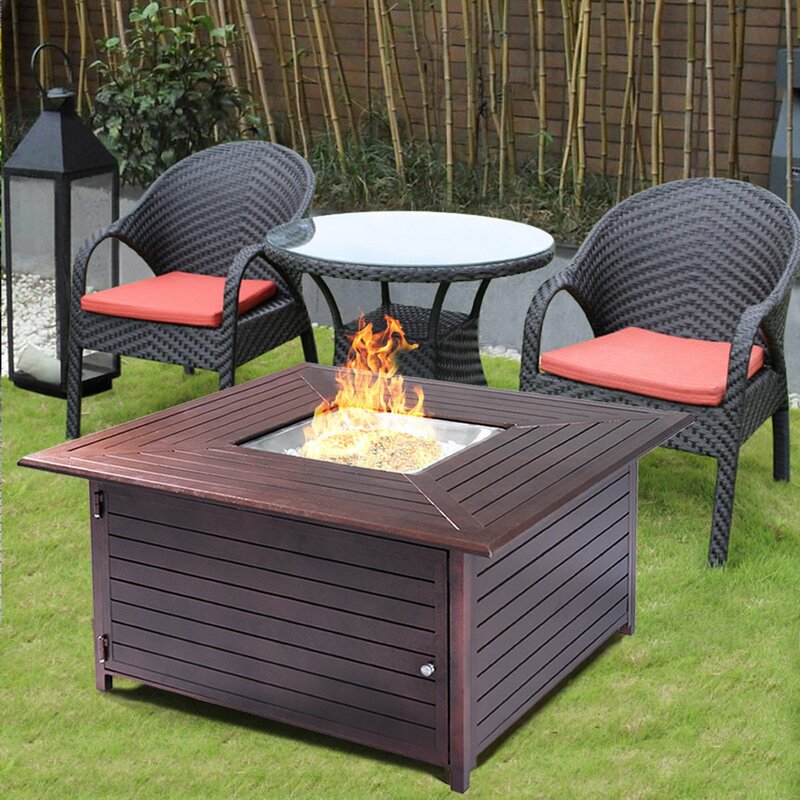 Take for example , the ability of a fire pit to convert to a table. 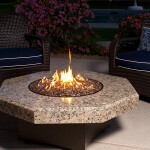 A fire pit that converts to a table is usually called a fire pit table. 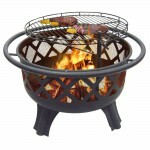 It is a kind of a fire pit that comes with a burner but with extra long rim edge(s). 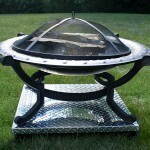 A fire pit table can with the help of a fire pit lid be converted to full table. 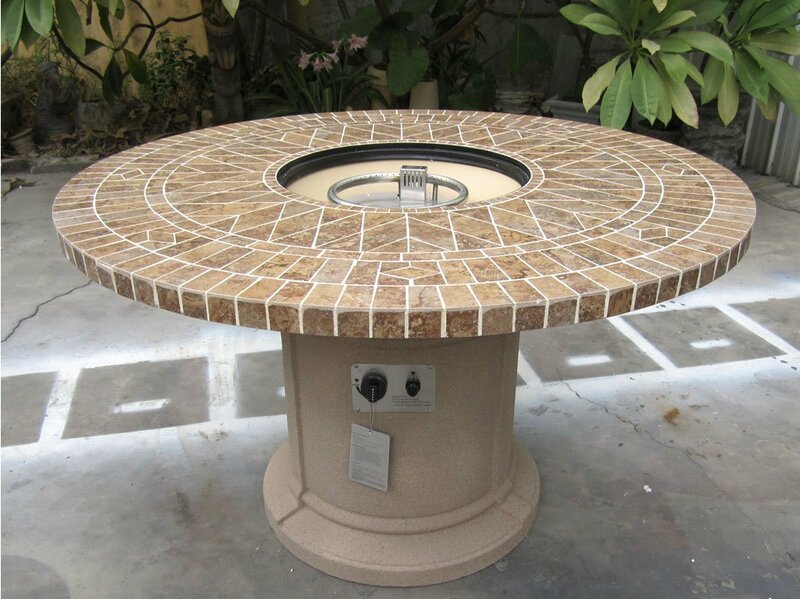 The fire pit lid is usually placed on the burner area when it’s not in use. 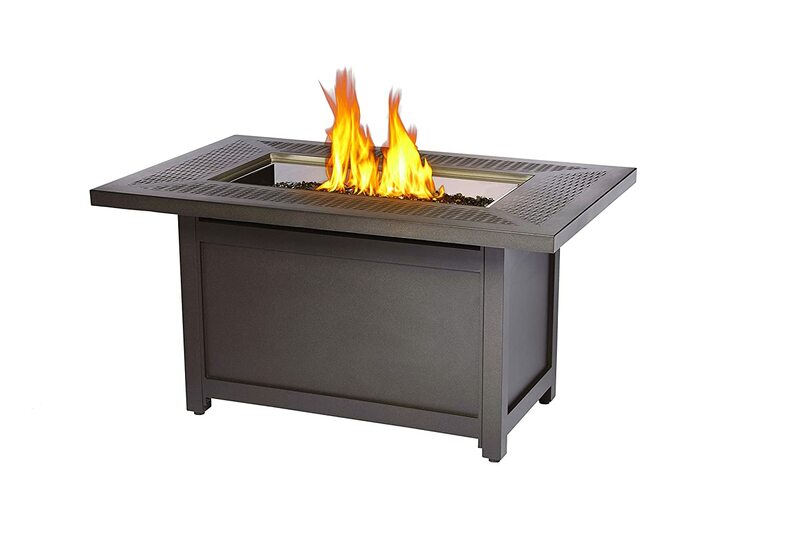 The lid usually fits perfectly over the burner area creating a full table top thereby transforming the fire pit table into a fully functioning table. 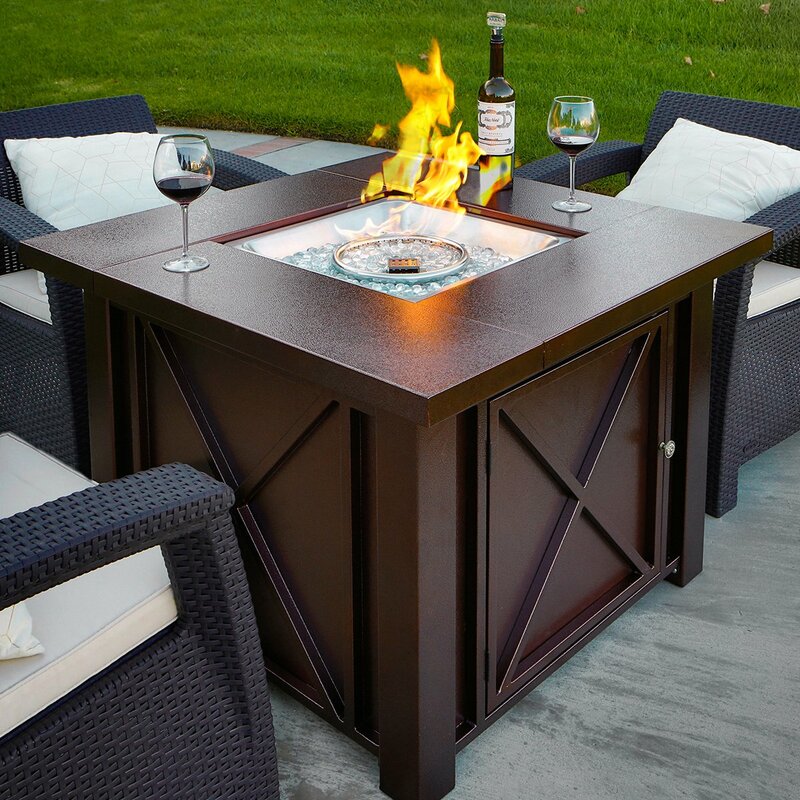 For one, you can assured that your fire pit lid will fit perfectly over your burner unlike the uncertainty and headache present with having to purchase one separately. 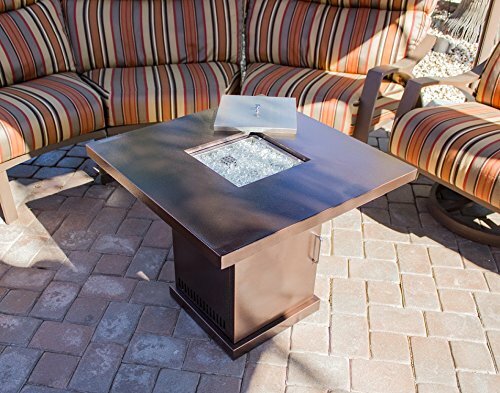 The lid will definitely match with your fire pit table which may not be the case when you purchase one separately. As I mentioned earlier most fire pit tables don’t come with a burner lid cover. 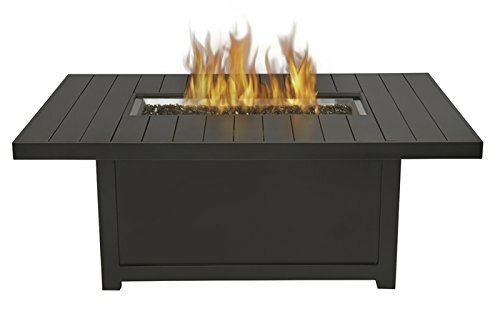 I have however gone through the trouble of making a list that has top quality fire pits that can be converted to tables. 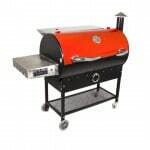 All the fire tables listed below operate on a 20lb Propane Tank which is not included with your purchase. The propane tanks are stored in the fire pit tables behind hinged doors on the sides. Hammered bronze powder coated finish with stainless steel legs. Burner cover is also made of of stainless steel. Square Table top is 38-Inch and sits at 28-Inch tall. 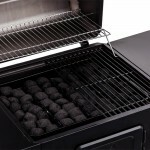 Burns on propane and has a heat output of 40,000 BTU’s. 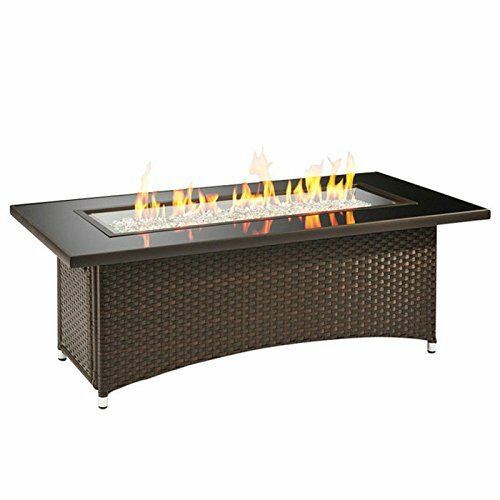 This steel fire pit table with bronze finish features an external Integrated Piezo Ignition that allows you to adjust the flames. Thermocouple and anti tilt safety devices to cut off the gas when the flame is disrupted,as well as also to save on propane gas by preventing gas leaks and wastage immediately the flames are out. Comes with decorative fire glass , SA regulator and hose. It features a 45″ inches square table top and sits at 22-1/2″ inches tall. 42,000 BTUS adjustable heat output. Clear decorative fire pit glass is included. 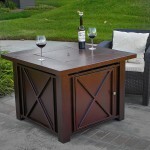 Features a 38″ square table top and is 28″ inches tall. Expect heat output of up to 40,000 BTU’s. 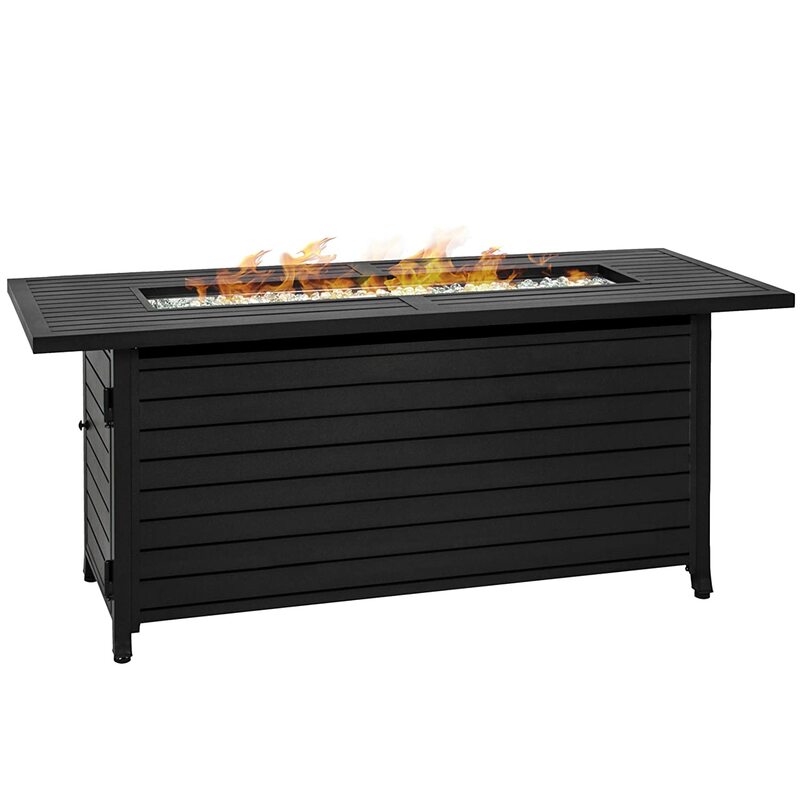 This fire pit that converts to a table features a steel construction with matte black and stainless finish. Piezo ignition system for fast and easy lighting. Comes with blue fire pit glass rocks. 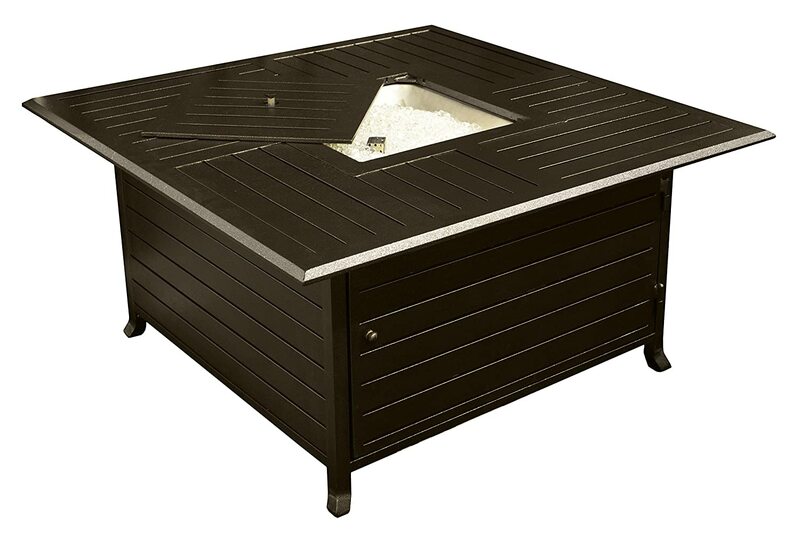 This 40,000 BTU extruded aluminum fire pit table. Burner lid is also of matching extruded aluminum. 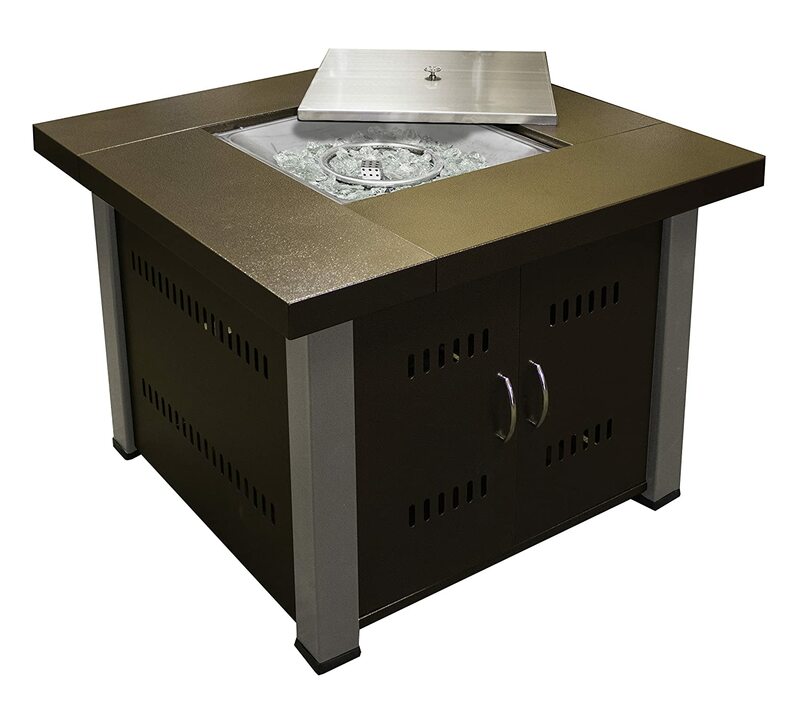 Comes 18 lbs clear decorative fire glass as well as protective weather covers for fire pit and propane tank. Forged from heavy duty cast aluminum with weather-proof powder-coated finish. This ensures that the fire pit table will not chip nor fade, thus weather resistant! Heat output of 55,000 BTUs. Forged from weather resistant aluminum with dark brown color and textured surface. 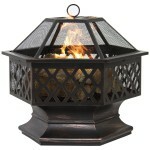 Overall fire pit dimensions:L 44.0″X W44.0″X H23.0″. 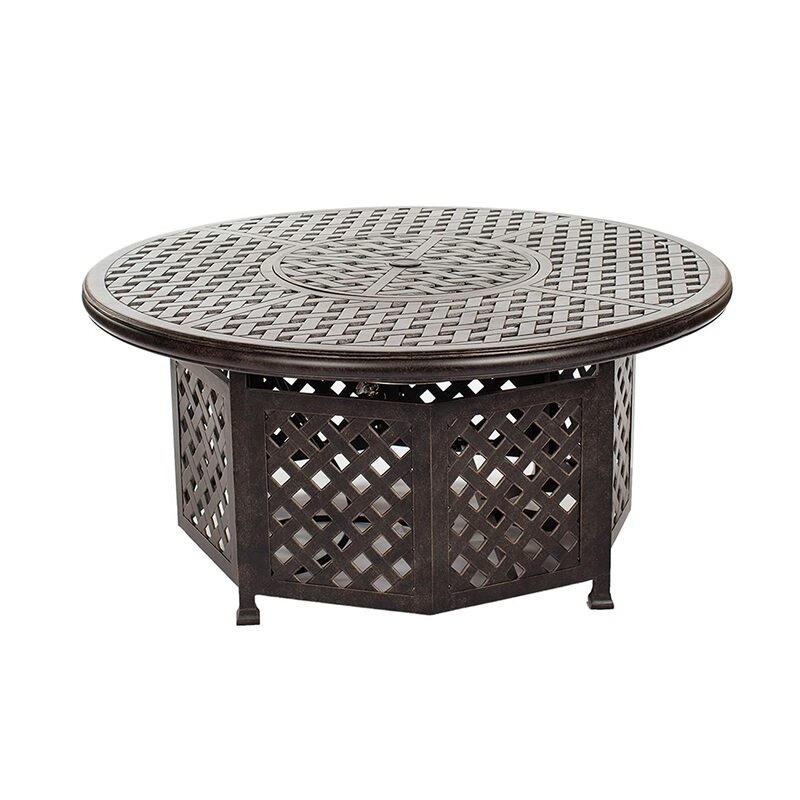 This round fire pit table features a Stainless steel frame in brown finish, Stonefire composite top and 16-inch round crystal fire burner. It comes with 10 pounds of diamond fire glass. Dimensions: 32W x 32D x 22.5H in. 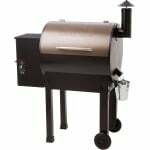 It is handcrafted from sturdy durable and all weather aluminum and features a classic rustic bronze finish for an antique look. The thermocouple valve cut off the gas when the flame is disrupted and prevents gas leaks. 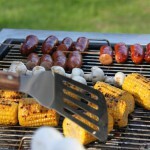 Drainage holes in the stainless steel burner prevent water accumulation if fire table is left in the rain accidentally. 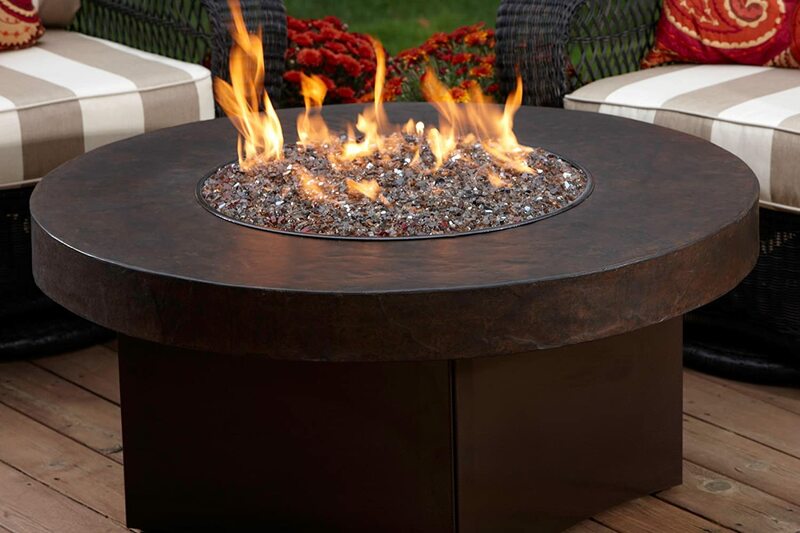 This fire pit that converts to a table is crafted with weather resistant, extruded aluminum in dark brown color and bronze finish. The burner has an adjustable heater and can burn at 50,000 BTUs. 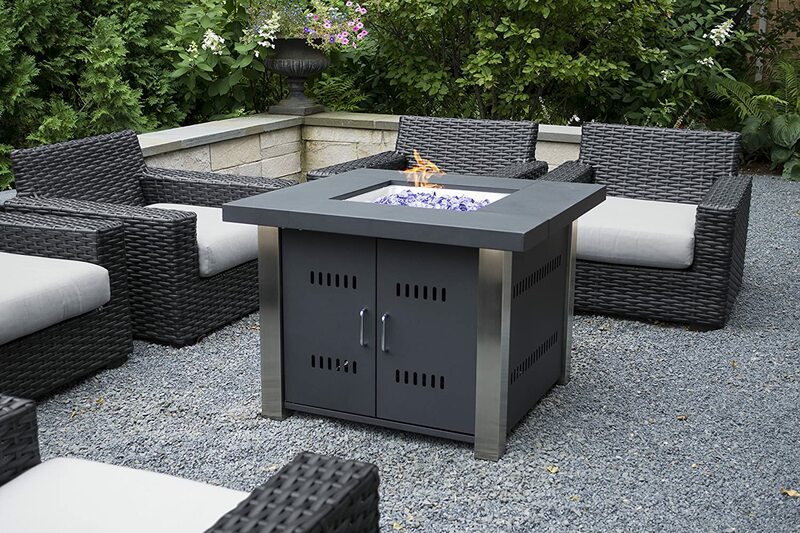 This set includes glass beads and a nylon cover to preserve the fire pits table’s quality when not in use. 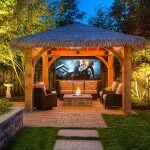 Constructed in rust-free aluminum with a rustic woven-top design and neutral finish. Emits up to 40,000 BTU’s of heat. A natural gas Conversion kit is also included. Simple table top with attractive wicker base. 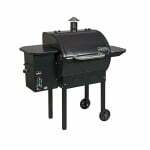 Features a 12 x 42 inch rectangular stainless steel burner with a 88,000 BTU rating. Comes complete with tempered diamond fire gems, an LP hose and regulator, a gas valve a metal flex hose, and a push button igniter. It is made from a Quartz-Concrete mixture and finished with in hand-troweled matte brown industrial look. 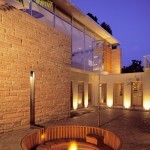 Mixture of Bronze Reflective, Copper and Platinum fire glass included. Up to 75,000 BTUs for propane gas and up to 90,000 BTUs on natural gas. Features a beautiful porcelain tile mosaic top. 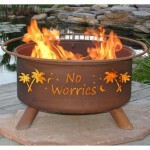 Comes complete with lava rocks, stainless fire pit bowl, protective canvas fire pit table cover. and electric start ignition system. Emits up to 50,000 BTU’s of heat. 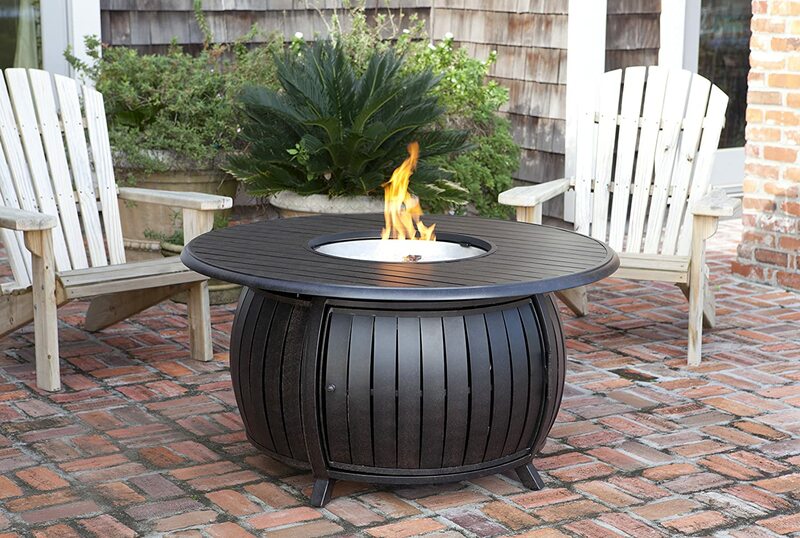 This fire pit that converts to a table produces up to 50,000 BTUs. 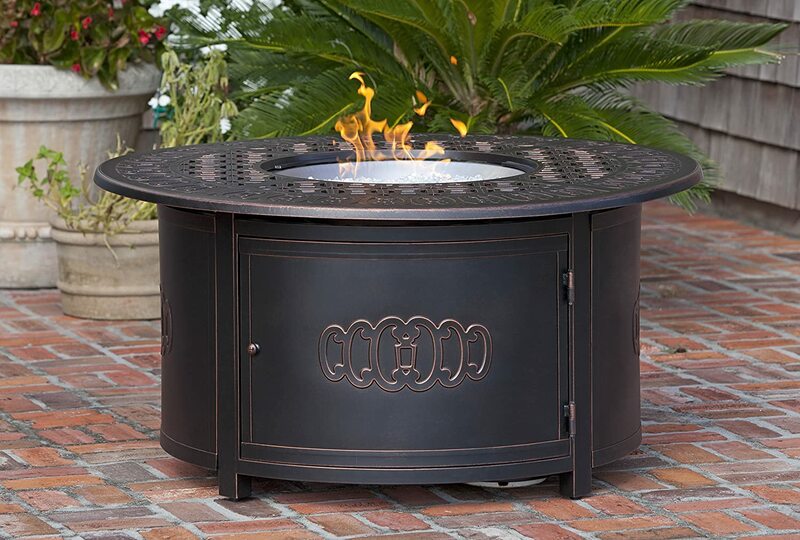 Our dynasty round cast aluminum LPG fire pit table comes complete with 18 lbs clear fire gems and all-weather protective cover for the fire pit.